In 2015, Dr. Meredith Jackson-de Graffenried (PhD, 2009) became Country Director of Helen Keller International (HKI) for Bangladesh. Max Stein, left, a UA doctoral student working in Peru, sits with Oths in her campus office (Bryan Hester). Kelsey Herndon (MA, 2015) has been awarded a 2016 DEVELOP Program internship by NASA. They work on remote ecological forecasting and related projects. Daniel R. Turner (BA, 2010; M. Phil Cambridge 2012) has been admitted to the PhD program in archaeology at Leiden University, Netherlands. He will be joining an archaeological project focused on the monumental architecture of Mycenaean Greece. We’re very proud of our alumni and their successes! If you know of any alumni updates that we don’t, please let us know. 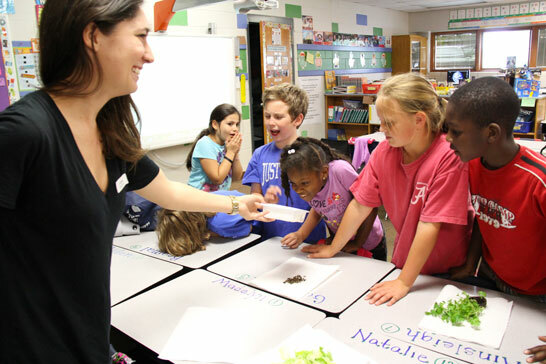 Kelsey Herndon (MA, 2015) teaches Tuscaloosa Magnet School Elementary kids as part of our department’s “Anthropology is Elemental” outreach program. In June, Dr. Kathy Oths was featured in UA’s Research Magazine in “Who Will Heal? Climate Change Disrupts Ancient Medical Tradition in Andes” (http://research.ua.edu/2015/06/who-will-heal-climate-change-disrupts-ancient-medical-tradition-in-andes/). In December, Dr. Virgil “Duke” Beasley (lecturer; MA, 1997) and Dr. Matt Gage (OAR) were featured an article entitled “Using the Future to Understand the Past” (http://research.ua.edu/2015/12/using-the-future-to-understand-the-past/). In the July UA News (http://uanews.ua.edu/2015/07/ua-researchers-to-explore-imaginative-play-links-to-cognitive-development/) and August 2015 Desktop News (http://www.as.ua.edu/2015/08/11/does-imaginative-play-influence-cognition/) from the College of Arts & Sciences, Dr. Jason’s DeCaro‘s grant from the Imagination Institute and collaboration with Dr. Ansley Gilpin (Psychology) on their project was featured . Our departmental elementary and middle school outreach program, rechristened “Anthropology is Elemental,” is pictured among the College of Arts & Sciences’ “Outreach and Economic Development Programs” (http://www.as.ua.edu/about_as/outreach-economic-development-and-entrepreneurship-programs-2/). Dr. Bill Dressler, Invited Lecture, East Carolina University, April 10, 2015. Dr. Chris Lynn was invited to speak to the EvoS program at SUNY New Paltz in New Paltz, NY on April 13 and gave a lectured called “Transcendental Medication: Defraying the Costs of Analysis Paralysis.” Dr. Lynn also collaborated with colleagues Dr. Michaela Howells and Katherine Cully at the University of North Carolina Wilmington, who were invited to conduct a workshop called “Understanding Humans: Using an Anthropological Approach in STEM Classrooms” at the 1st Annual K-12 STEM Education Conference in Wilmington, NC on January 9. Eubanks, Paul N. Salt production technology in Southern Alabama and the Greater Southeast. Lynn, Christopher D., and Greg Batchelder. Anthropology is Elementary: Translating the Science of Humanness through Hands-On Activities. Eubanks, Paul N. Salt production trends in the Caddo homeland and in the Southeastern United States. Ashley Daugherty and Melinda Carr explaining their NEEPS poster, Boston, MA. Daugherty, Ashley, and Melinda Carr. Fireside Relaxation: A Burning Question. Friel, Juliann. Reflections on Being Human. Dominguez, Johnna T., Jason A. DeCaro, and Christopher D. Lynn. Tattooing as Protection against Enemy Arrows: Enhanced Immune Response among the Heavily Tattooed as an Allostatic Stress Response. Lynn, Christopher D., Juliann Friel, William Evans, and Baba Brinkman. Evolution Education through Excitement and Anger: “Rap Guide to Evolution” Influences on Skin Conductance..
Eubanks, Paul N. A summary of the 20-14 excavations at Drake’s Salt Works. Funkhouser, Lynn and Daniel LaDu. The faunal record at Mazique (22Ad502): Initial impressions from the 2013 field season. Kowalski, Jessica A. and H. Edwin Jackson. On the Mound trail: Mississippian polities in the Lower Yazoo Basin. Malischke, LisaMarie. Watercolor ideal versus architectural reality: New interpretations of Fort St. Pierre, Vicksburg, Mississippi. Carr, Melinda, Ashley Daugherty, and Christopher Lynn. A Burning Question: Fireside Relaxation. Lynn, Christopher D., and Max J. Stein. Religious Collectivity and the Behavioral Immune System in Limón Province, Costa Rica. Eubanks, Paul N. and Ian W. Brown. Salt production and economic specialization at Drake’s Salt Works. LeCount, Lisa J. and David W. Mixter. Between Earth and Sky: The Social and Political Construction of Ancient Lowland Maya Territories. DeMoss, Lessye. Cultural models for life preparation: An exploration of young American men’s shared understandings of this developmental task. Dressler, William W. What is generalized cultural consonance? Morrow, Sarah Elizabeth. Shared beliefs without shared consensus: A look at experiential model development in food insecure women. Oths, Kathryn and Hannah Smith. Rapid ecological, social, and cultural change in the Northern Peruvian Andes and its effects on child growth. Read-Wahidi, Mary Rebecca. Continuity and change in Guadalupan devotion. Weaver, Lesley Jo, Bonnie Kaiser, and Craig Hadley. Food insecurity and mental health in three settings: Preliminary results and future directions. González-Faraco, Juan Carlos, Inmaculada Iglesias-Villarán, and Michael D. Murphy. Youth Culture and HIV/AIDS in Spain. Becerra, Fatima. Herbal medicine use in the Peruvian highlands. Carr, Melinda, and Ashley Daugherty. A burning question: Fireside relaxation. Forrister, Anna. 50 years of all deliberate speed. Hallquist, Sommer and Madeline Anscombe. Dealing with death. A study of children’s changing grave themes and what they reveal about American society. Lawhon, Taylor. An investigation of Caddo salt production at Drake’s Salt Works. ECU anthropology professor Dr. Blakely Brooks leads an ECU Global Understanding class. Jonathan Belanich, who received his BA in 2014 in Anthropology and Biology and is currently enrolled in the MA program at Mississippi State, received Honorable Mention for his National Science Foundation Graduate Research Fellowship Program application. This program is highly competitive, and our faculty wrote letters of recommendation for his proposal, so we consider this an honor that reflects on our preparation of him. Dr. Chris Lynn was considered “Worth Quoting” in the January and February UA Dialog. From January (http://dialog.ua.edu/2015/01/dialog-extra-for-jan-5-2015/): “Stress can kill you, literally, and having means of reducing stress is going to be critical for the survival of species,” as quoted in Men’s Health. Lynn is the author of a study that suggests that sitting by a fire can lower people’s blood pressure and help them relax. From February (http://dialog.ua.edu/2015/02/dialog-extra-for-feb-5-2015/): “When we aren’t used to having down time, it results in anxiety … (a)nd we reach for the smartphone. It’s our omnipresent relief from that,” as quoted in the Aberdeen (South Dakota) News. The March UA Dialog (http://dialog.ua.edu/2015/03/accolades-for-march-2-2015/) recognized Dr. Lisa LeCount for being awarded a National Geographic Research and Exploration grant and Dr. Jason DeCaro (http://dialog.ua.edu/2015/03/uas-first-faculty-research-day-set-for-april-8/) for being selected for the President’s Faculty Research Award. In April, the UA Dialog (http://dialog.ua.edu/2015/04/accolades-for-april-13-2015/) also recognized Achsah Dorsey and her adviser Jason DeCaro for her receipt of the University’s Outstanding Research by a Master’s Student award. In May, recent Anthropology BA Maryanne Mobley was recognized with 13 other UA graduates in UA Dialog (http://dialog.ua.edu/2015/05/14-ua-graduates-receive-fulbright-awards-for-2015-16/) for being honored with a Fulbright Award. Maryanne will be traveling to teach in South Korea. The Biocultural Medical Anthropology faculty were asked to contribute a guest column for the Anthropology News online this year based on their “Biocultural Systematics” blog. Three columns have appeared so far by Bill Dressler, Jason DeCaro (http://www.anthropology-news.org/index.php/2015/03/02/whats-biological-about-biocultural-research-part-1/), and Jo Weaver (http://www.anthropology-news.org/index.php/2015/04/14/challenges-of-mixed-method-research/); and Dr. Dressler’s column “‘Culture’…Again” (http://www.anthropology-news.org/index.php/2015/01/30/culture-again/)received enough page views to merit publication in the May print edition of Anthropology News. Our colleague, Dr. John Blitz, is cited heavily in this recent American Archaeology article (http://www.archaeologicalconservancy.org/atlatls-arrows/, vol. 19, No. 1, 2015), “From Atlatls to Arrows.” Congratulations John—Good stuff! The Crimson White profiled Dr. Chris Lynn‘s efforts to develop the Evolutionary Studies program this semester (http://www.cw.ua.edu/article/2015/02/lynn-grows-evolutionary-studies-at-alabama). Congrats to Dr. Lynn for his hard work on the EvoS program, and please contact him at cdlynn@ua.edu to enroll or for more information. The Crimson White also published a piece (http://www.cw.ua.edu/article/2015/01/campfires-aid-blood-pressure-study-says) on Dr. Lynn Fireside Relaxation Study, the Evolutionary Psychology article that came out at the end of 2014, and the efforts of students like Melinda Carr and Lauren Pratt and alumnus Meghan Steel in this ongoing study. Finally, Dr. Lynn provided ideas for UA News‘ “UA Matters” column in February for an atypical Valentine’s Day (http://uanews.ua.edu/2015/02/ua-matters-happy-atypical-valentines-day/) and in April for those considering online dating (http://uanews.ua.edu/2015/04/ua-matters-thinking-of-online-dating-a-few-items-to-consider/). Dressler, W.W. The five things you need to know about statistics: Quantification in ethnographic research. Walnut Creek, CA: Left Coast Press. Dressler, W.W., M.C. Balieiro, and J.E. dos Santos. Finding culture in the second factor: Stability and change in cultural consensus and residual agreement. Field Methods 27: 22-38. Eubanks, Paul N. A reconstruction of the Caddo salt making process at Drake’s Salt Works. Caddo Archaeology 25:145-166. Jason DeCaro is one of several recipients of a grant from the Administration of Children and Families who will implement and assess intervention programs to improve school readiness and child well-being among Head Start preschoolers in West Alabama. In partnership with the Community Service Programs of West Alabama (CSPWAL), he and the other grantees (Ansley Gilpin and John Lochman from Psychology and Caroline Boxmeyer from Psychiatry and Behavioral Medicine) will follow children into first grade to assess the effectiveness of programs that teach children social and emotion regulation skills, and support parents and teachers in fostering positive home and school environments. DeCaro and colleagues are receiving $2.25 million over 5 years to assess these program, which a classroom curriculum for the children, and interventions to address broader challenges – such as parental mental health, job prospects, and financial obstacles – that influence family well-being. Dr. DeCaro’s involvement in the project centers around assessing child stress to determine what difference stress responses at baseline make in the effectiveness of the intervention, and how well the intervention does in mitigating stress over the long term. In October, Dr. Chris Lynn was interviewed for an article on glossolalia (speaking in tongues among Charismatics and some other religious practitioners through the ages) and stress reduction. Dana Foundation is a private philanthropic organization dedicated to brain research. The article discusses Dr. Lynn’s dissertation fieldwork among Pentecostals in upstate New York, which compared rates of speaking in tongues to salivary biomarkers of stress and found some preliminary evidence for a relaxation effect. In November, Dr. Lynn was also interviewed about UA’s Evolutionary Studies program, housed in the Department of Anthropology, for the newsletter EvoS Illuminate, published by the EvoS Consortium. In it, Dr. Lynn highlights the program at Alabama, discusses his evolution blogging efforts, and background. Later that month, Dr. Lynn and EvoS Club President and Anthropology major Taylor Burbach were contacted by The Crimson White for an article about the EvoS program. The article highlighted the importance of the program for UA students and the outreach efforts they’re engaged in for the community. In December, Ph.D. student Tina Thomas published a piece in Anthropology News entitled “Multiple Worlds Theory and ‘High Risk Girls’ Versus Those that ‘Stay Inside’” about her research into risky behavior among teenage girls in Alabama and HIV risk. Alabama has one of the lowest rates of condom use among high school students in the United States, and Thomas’ research has found that this may be due, in part, to girls’ conceptualization of the protection afforded by condoms. According to Thomas, many of her participants believe that condoms have a high failure rate because of notions that they can clip off or break easily. Thomas’ continuing research seeks to understand the cultural models underlying these beliefs in high- and low-risk groups in Alabama. Alabama Anthropology research was well represented at regional and national conferences this past fall! Armine Goertz, Jolynn. Fragments and Field Notebooks. Franz Boas and the Chehalis Oral Tradition. Paper presentation at the 112th Annual Meeting of the American Anthropological Association, Chicago, IL, Nov. 20-24, 2013. Davis, Jera R. Moundville’s Defining Moment: Plazas, Architecture, and Collective Vision in Polity Formation. Paper presented at the Southeastern Archaeological Conference, Tampa, FL, Nov. 6-9, 2013. Dengah II, H.J.F. Blessings of the Holy Spirit: How Religious Cultural Consonance Shapes Well-being among Brazilian Pentecostals. Paper presented at the 112th Annual Meeting of the American Anthropological Association, Chicago, IL, Nov. 20-24. Dengah II, H.J.F. Blessings of the Holy Spirit: How Religious Cultural Consonance Shapes Psychological Well-being among Brazilian Pentecostals. Invited lecture given for the Colorado State University Alumni Lecture Series, Fort Collins, CO.
DeCaro, Jason, and Warren Wilson. Maternal Mental Health as a Mediator of the Impact Food Insecurity on Child Health in a Peri-Urban Region of Tanzania. Oral presentation at the Canadian Association of Physical Anthropologists, Scarborough, Ontario, Canada, Oct. 17-20, 2013. DeCaro, Jason, and Warren Wilson. Untangling the Knot of Correlated Adversities: Food Insecurity, Maternal Depression, and Maternal & Child Health in Mwanza, Tanzania. Oral presentation at the 112th Annual Meeting of the American Anthropological Association, Chicago, IL, Nov. 20-24, 2013. Dressler, William W. Stability and Change in the Cognitive Structure of Four Cultural Domains after Ten Years. Abstracts of the 112th Annual Meeting of the American Anthropological Association, Chicago, IL, Nov. 20-24, 2013. Eubanks, Paul N. The Timing and Distribution of Caddo Salt Production in Northwestern Louisiana. Paper presented at the 70th Annual Meeting of the Southeastern Archaeological Conference, Tampa, Florida, Nov. 6-9, 2013. Funkhouser, Lynn. An Analysis of Near-Mound Cemeteries at Moundville. Paper presentation at the Southeastern Archaeology Conference annual meeting, Tampa, FL, Nov. 6-9, 2013. Galbraith, Marysia. Engagements with Past, Present, and Future through Cultural Heritage. Poster session organized for the 112th Annual Meeting of the American Anthropological Association. Chicago, IL, Nov. 20-24, 2013. Galbraith, Marysia. Selective Memories and Contested Futures: Temporality and Collective Representations. Poster presentation at the 112th Annual Meeting of the American Anthropological Association, Chicago, IL, Nov. 20-24, 2013. Herndon, KE, BA Houk, M Willis, CP Walker, and A Booher. Structure from Motion Mapping and Remote Sensing at the Maya Site of Chan Chich, Belize. Presented at the South-Central Conference on Mesoamerica; Houston, Texas. November 2, 2013. Knight, Vernon James. Discussant: Remembering Charlie: A Roundtable Discussion on the Life and Work of Charles Hudson. Southeastern Archaeology Conference annual meeting, Tampa, FL, Nov. 6-9, 2013. Kosiba, Steve. “Construyendo un paisaje inka: La constitución de la autoridad durante la formación del Estado inkaiko (Cuzco, Perú).” Invited lecture, Paper presented at the Programa de Estudios Andinos, Facultad de Letras y Ciencias Humanas, Pontificia Universidad Católica del Perú, Lima, Peru, 2013. Kowalski, Jessica. Mississippian-Period Settlement Size and Soil Productivity in the Southern Yazoo Basin, Mississippi. Paper presentation at the Southeastern Archaeology Conference annual meeting, Tampa, FL, Nov. 6-9, 2013. LaDu, Daniel. The 2013 Excavations at the Mazique Mounds. Paper presentation at the Southeastern Archaeology Conference annual meeting, Tampa, FL, Nov. 6-9, 2013. Lazo, Rodrigo, Kathy Oths, and Max Stein Assessing Change and Continuity in an Andean Medical System American Anthropological Association, 112th Annual Meetings, Chicago, IL. Nov.20-24, 2013. LeCount, Lisa J., David W. Mixter, and Borislava Simova. All the King’s Men: Investigating the Nature of Preclassic Maya Elite Households and Kingship at Actuncan, Belize. A paper presented at the 11th annual Belize Archaeology symposium, San Ignacio, Belize, July 4, 2013. LeCount, Lisa J. At the Intersections of Powers: Markets and Commodities in Classic Maya Society. A paper presented at the 78th Annual Meeting of the Society for American Archaeology in the symposium Households, Markets, World-Systems, and Political Economy: Alternative Pathways to Complexity, organized by Lane Fargher and Verenice Y. Heredia Espinoza. Honolulu, Hawaii, April 5, 2013. Lynn, Christopher D. Defraying the Costs of “Analysis Paralysis”: A Neuroanthropological Model of Dissociation, Deafferentation, and Trance. Invited talk for the 113th Annual Meeting of the American Anthropological Association. Chicago, IL, November 20—24, 2013. Lynn, Christopher D. The Ecological Diversity of Transcendence. Invited talk for the Tuscaloosa Secular Humanists. Tuscaloosa, AL, September 25, 2013. Mixter, David W., and Lisa J. LeCount. Building History through Households: Contextualizing Social and Political Transitions at Actuncan. A paper presented at the 11th annual Belize Archaeology symposium, San Ignacio, Belize, July 4, 2013. Oths, Kathy. Discussant: When the Doctor Is Not In: Emergent Practices of Care in Patient/Nonphysician Provider Interactions. American Anthropological Association, 111th Annual Meetings, San Francisco, CA. Nov.20-24, 2013. Oths, Kathy. Roundtable Presenter: The Inextricability of Environment and Culture in the Emergence of 21st Century Maladies: Potential Contributions of Anthropology. American Anthropological Association, 111th Annual Meetings, San Francisco, CA. Nov.20-24, 2013. Read-Wahidi, Mary Rebecca. Poor and Living in a Foreign Land: Mexican Immigrants Coping with Life in Mississippi. 112th Annual Meeting of the American Anthropological Association. Chicago IL. Nov. 20-24, 2013. Smith, Karen Y., and Vernon James Knight. The Role of Primitive Geometric Elements in Swift Creek Art. Poster presentation at Southeastern Archaeological Conference annual meeting, Tampa, Florida, Nov. 6-9, 2013. Steel, Meghan, and Christopher D. Lynn. Fireside Meditations: The Induction of a Relaxation Response by Focused Attention on a Flickering Light and Novel Sound Phenomenon. Oral presentation at the 112th Annual Meeting of the American Anthropological Association. Chicago, IL, Nov. 20-24, 2013. Stein, Max J. and Christopher D. Lynn. Religion as Resilience: Evaluating the Intersections of Religious Collectivity and Disease in Limón Province, Costa Rica. Paper presented at the 112th Annual Meeting of the American Anthropological Association, Chicago, IL, Nov. 20-24, 2013. Red Forge Productions & the College of Arts & Sciences were kind enough to help us create a great new promotional video that highlights our department strengths! All true!! Please share far & wide!!! !